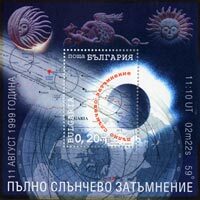 These three photographs of the total solar eclipse of March 29, 2006 were taken in the town of Rubtsovsk (Altaj area) by Igor' Rogovoy of Novosibirsk, Russia. The Sun's corona during the total solar eclipse of April 12, 2002 in Australia (photo by Igor' Rogovoy). A time sequence of 7 images captures the formation of Baily's beads and their subsequent merging into the growing solar crescent immediately following the third contact. The total solar eclipse of March 29, 2006. The photos were made by Leonid Durman, Russia with a Canon 350D camera and a TAL 125mm f/10 refractor. 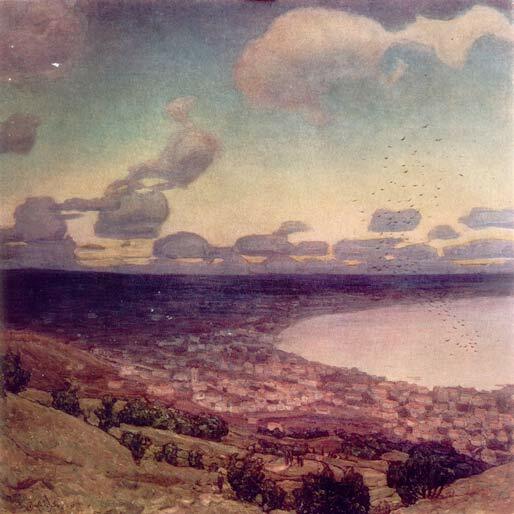 The painting "The Shadow of the Moon approaching Feodosia" by a well-known Russian painter Apollinary Vasnetsov. It was made immediately after the eclipse of August 21, 1914, which he observed with the field-glass in Crimea. 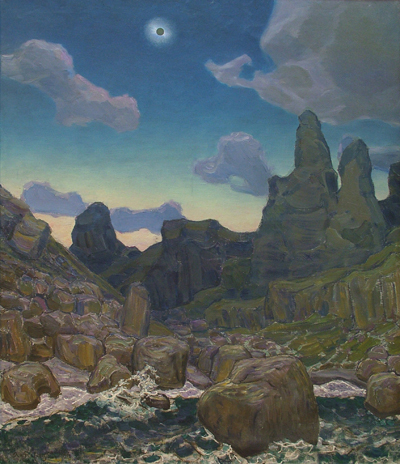 The painting "Solar corona (near Karadag)" was made by Apollinary Vasnetsov after the eclipse of 1914 also (this landscape is now exhibited in Novosibirsk Picture Gallery). Romania. The total solar eclipse of February 15, 1961. Mauritania. The total solar eclipse of December 24, 1973. Scott #133-135. Portugalia. The ring solar eclipse of 2005.10.03. Romania. The total solar eclipse of 1999.